Do you have Pups and Kittens for Sale? Or a service to advertise? 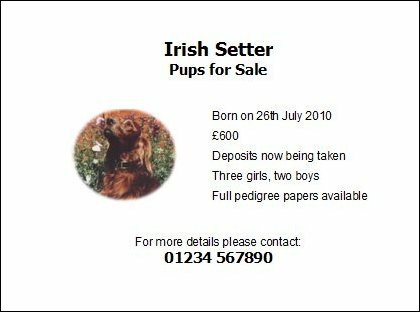 On this page I'll show you some items that may be useful if you have a litter of puppies or kittens for sale. 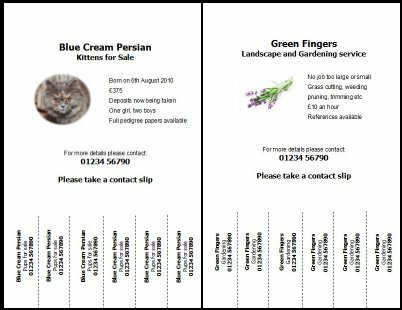 Please also see these items: Puppy and kitten document wallets, Receipts and sale agreements, worming certificates, Pedigrees, Diet sheets etc. What about actually selling the litter? You may have people interested but if not, you'll need to advertise them, maybe by putting a card up in your local vet or pet shop. Here are two items which may help. The cards can also be used for advertising a service - eg gardening, a driving school, decorating. The posters are very useful if you want people to easily be able to take a note of your details. We don't always have a pen and paper on us! Normal postcard size (1/4 A4)For shop windows or to hand out. On white or cream card. Photo or clip art. The layout can be adapted to suit what you want. 25p each in mono, 30p each in colour. A4 or A5 size on white or cream card. Photo or clip art. The layout can be adapted to suit what you want. The poster is clipped where the dotted lines are shown so that people can tear off a slip and have a copy of your phone number - handy if they don't have any means of noting the details on your poster. A4 £1.40 in colour - A5 85p each in colour.